"We realize that our true self is not reached through other people but found deep inside of us during communion with our Soul." 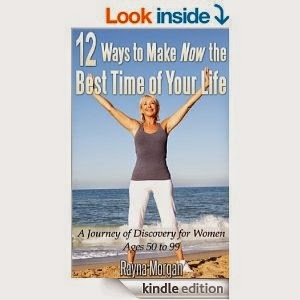 "12 Ways to Make Now the Best Time of Your Life: A Journey of Discovery for Women Ages 50 to 99" by Rayna Morgan is a book about living the second half of life to the fullest by moving past social and internal barriers. "12 Ways" describes ways in which women can gain a better understanding of their life journeys and themselves during this time of new perspectives and changing social roles in regards to "working, parenting, socializing." Morgan recommends embracing and consulting with your Inner Guide and prodding the needs of your Soul to achieve inner peace and self-worth. Similarly, Morgan recommends time in solitude as the first steps to realizing a limitless and boundless existence. In addition, the author recommends trying new things to make this second half of life an ever better adventure than the first half. Morgan's strongest point is when she writes about the need to search for the spiritual reason for our earthly lives and when she advocates for the seeking inwards instead of outwards for happiness. The writing in "12 Days" is terrific! Morgan really understands the personal and social issues that women face in this life stage and even uses the lifespan perspective to try and explain certain behaviors and feelings, especially concerning social roles. "12 Ways to Make Now the Best Time of Your Life: A Journey of Discovery for Women Ages 50 to 99" is a top-notch piece to help women reach their full potential as they transition from motherhood and full-time work. Recommended!